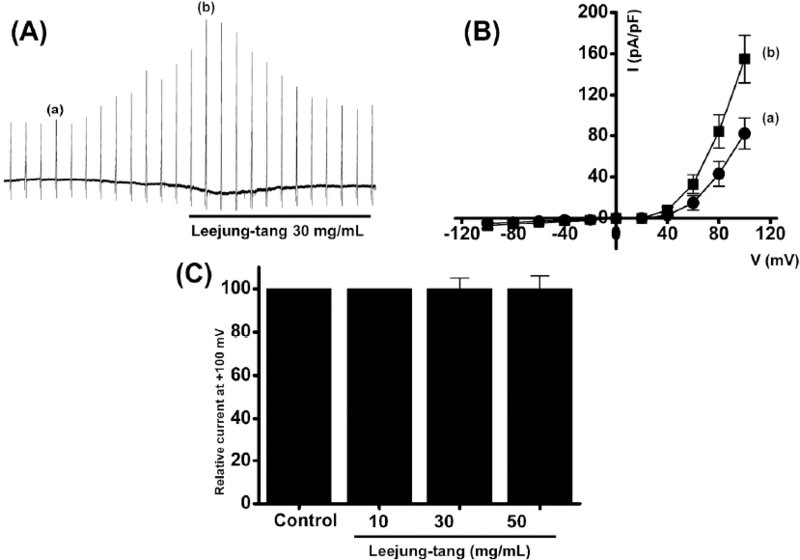 Effects of Leejung-tang on overexpressed transient receptor potential vanilloid 4 (TRPV4) currents in human embryonic kidney (HEK) 293 cells and the current-voltage (I-V) relationship using the whole cell patch-clamp technique. (A) Leejung-tang had no effect on the overexpressed TRPV4 currents in HEK 293 cells at a dose dependent manner. Slow ramp depolarizations from +100 to -100 mV were applied from a holdingpotential of -60 mV before (a) and during (b) treatment with Leejung-tang. (B) I-V relationships were determined before (a) and during (b) treatment. (C) Concentration-dependent effects of TRPV4 currents by Leejung-tang.